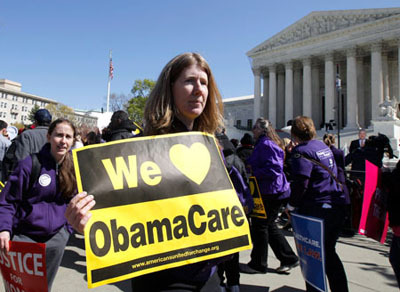 Whether Democrats can change a pejorative into a positive is unclear, but after three years on the defensive, they have resigned themselves to the fact that “Obamacare” has become the popular name for the sweeping social program, and they are trying to spin it in their direction. Particularly since the Supreme Court upheld the law’s constitutionality, Mr. Obama and his allies have tried to take ownership of the term. I’ve always been fine with Obamacare as a nickname, much the same way that Reaganomics is a nickname for supply-side economics. And whether embracing it converts the term Obamacare from a pejorative into a positive depends entirely on Obamacare itself, I think. “Neoconservative” started out as a pejorative term and did just fine when neocons made it into a popular doctrine. Conversely, “welfare” used to be so plainly positive that conservatives urged other conservatives not to use the term. But that changed when conservatives made welfare itself suspect. Likewise, if ACA eventually becomes popular, then Obamacare will be a positive term. If it fails, then it will fade away. It’s that simple.